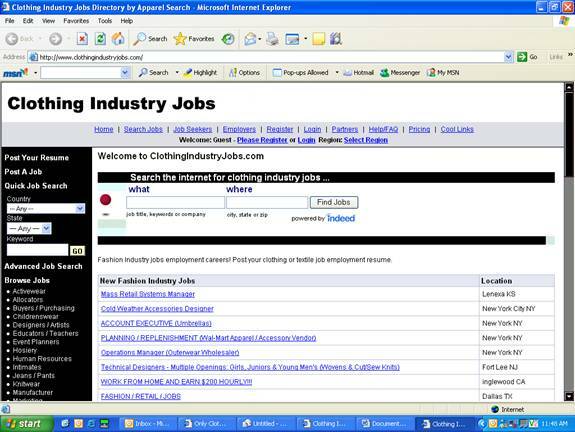 The Apparel Search Company SOLD the ClothingIndustryJobs.com website in October 2012. After nearly a decade of development, we have decided to focus on other projects. Although the Apparel Search web site had an employment message board system since the first year of the web sites development, the board was for lack of a better word, "terrible". Therefore, we invested in a new system and have launched our employment site at ClothingIndustryJobs.com If you are wondering why we did not simply place the employment system directly on the ApparelSearch.com web site, the answer is rather simple. We did not wish to risk overloading our main web site with too many databases. The idea has been that keeping the employment system at a separate address, would be easier to manage. We then had two primary sections for employment issues. Our Fashion Industry Jobs Directory - employment resources, employment agency listings, job guides, employment articles etc. Our Clothing Industry Jobs website - jobs database system for employers to post job opportunities for the fashion and textile industry. In addition to benefiting "employers", the service aids "employees" with locating employment opportunities relevant to fashion, clothing or textiles. Fashion industry employees can post resumes that they can edit as their experience changes. The Clothing Industry Jobs web site was created as a Free service for posting and reading employment opportunities & resumes. Check out our new Fashion Job Search site, launched January 2007. If you are searching for a career in the fashion industry, we suggest you try the ClothingIndustryJobs.com website. If you are an employer seeking employees with fashion experience this is a wonderful place to post a job opportunity. On the Clothing Industry Jobs website directory you will find numerous employment opportunities. It is a good place to start your fashion career or expand an existing one.